Passenger viewing Ethan Estess’ Last Dive at the Farallones: 100,000 marine mammals killed per year. 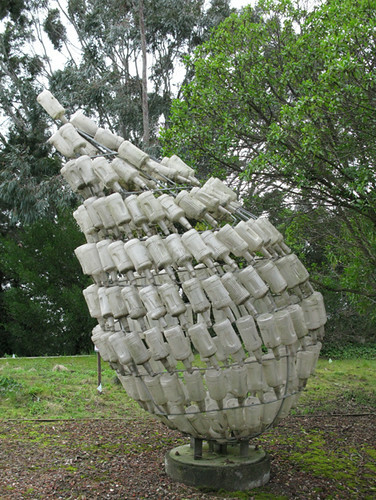 Made from copious amounts of plastics and rope found during his student artist residency at the SF Transfer Station, the sculpture calls attention to the perilous state of our oceans. 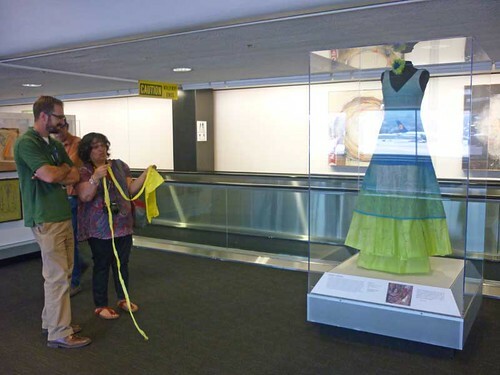 Textile artist Sandy Drobny explains to SFO Museum Curator Tim O’Brien how she worked with a variety of scavenged materials while at the dump, including caution tape, twist ties, plastic shopping bags, and inner tubes to fashion a series of aprons and other garments. This full-length gown, Evening News, was made from the ubiquitous bags used to deliver newspapers. While American language dictionaries define “Garbage” as any matter that is no longer wanted or needed and anything that is contemptibly worthless, inferior, or vile, over a hundred artists have been disposing of these definitions for over 20 years through Recology’s Artist in Residence program at the San Francisco Solid Waste Transfer and Recycling Center. Also known as “The Dump,” this destination of all things unwanted holds a rather strange place in our collective consciousness. 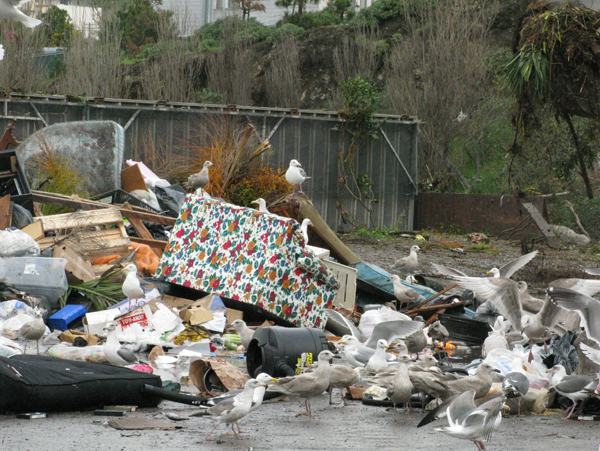 Due to modern technology making it possible to become accustomed to prompt, efficient, routine, and cheap door-to-door waste removal on a daily basis, landfills have reached an almost mythical status that could only be considered a pinnacle of success in a throw-away consumer society: their effectiveness in removing all traces of materialistic excess has made them non-existent in our minds. But exist they do, and each year Americans generate about 250 million tons of materials deemed unwanted, about 4.40 pounds per person per day! After we casually toss all the things that often have been in our possession for barely 15 minutes in our bins and close the lids, it all gets picked up by a fleet of trucks hauling our rejects to transfer stations almost around the clock. 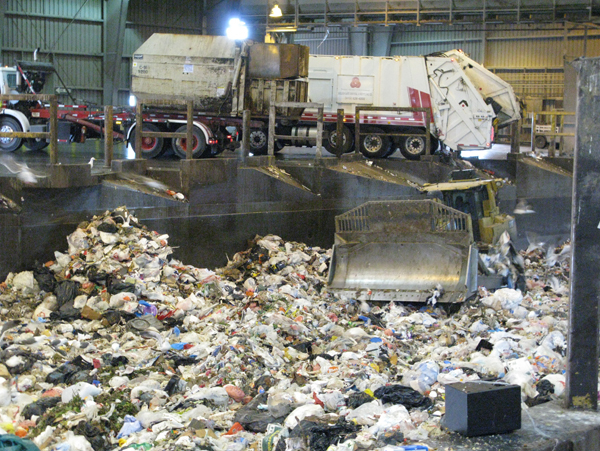 About one third of materials nationwide gets recycled or composted, but the rest of our trash we so conveniently “stash” ends up in large holding areas en route to their final destination: a big hole in the ground somewhere we don’t ever visit. Destination “Dump” at the San Francisco Solid Waste Transfer: Leading the nation with 80% waste diversion, but the remaining 20% still make a big pile. The City of San Francisco and its waste management resource recovery company Recology recognized a long time ago that the kind of wasteful trajectory American municipalities were on could not be sustained indefinitely. 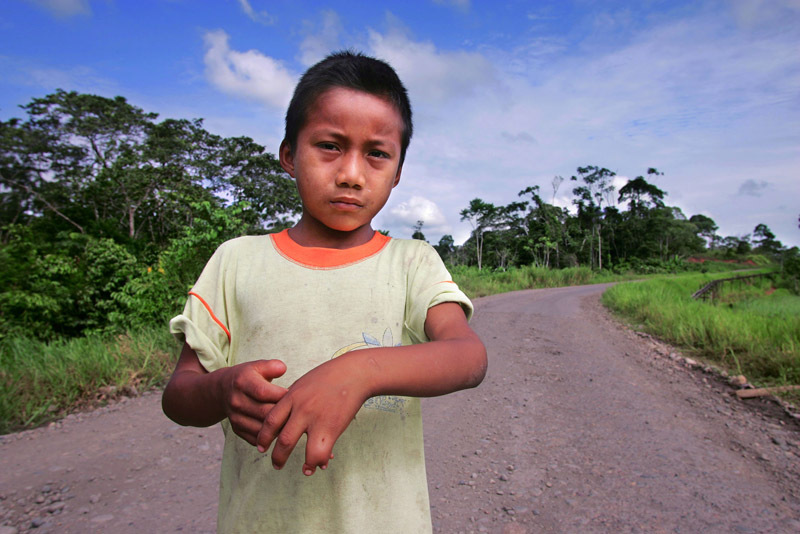 From overflowing landfills and dwindling resources to toxic pollution from plastics and rising greenhouse gas emissions from organic matter, this country simply wouldn’t be able to afford to bury large parts of its precious resources in the ground much longer, both from an environmental and economic long-term perspective. So long before Mayor Bloomberg’s announcement that New York City would begin to compost about 10 percent of its residential food waste, resourceful visionaries in the City by the Bay were piloting composting, recycling, and conservation programs that would ultimately lead to the city’s 2003 resolution to reach Zero Waste by 2020, followed by a first-in-the-nation plastic bag ban in 2007, and its groundbreaking 2009 Mandatory Recycling and Composting Ordinance that together have led to an unprecedented 80% waste diversion rate. As San Francisco has proven, the right incentives, technology, habits and laws go a long way toward eliminating the most obvious and retrievable chunks from your waste stream. The first half of the full distance can be covered relatively painlessly, and quite a few cities across the United States have now reached that important threshold. But once a city gets past 50 percent it gets interesting, as residents and businesses learn to embrace their rotting food scraps. 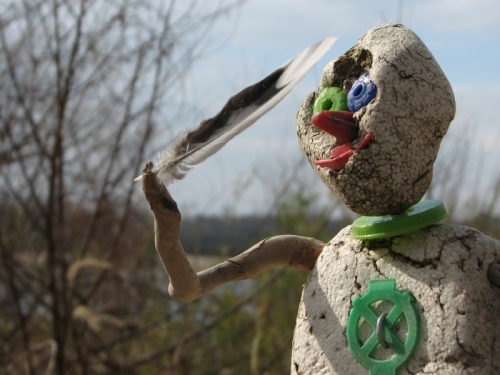 Getting to three quarters requires letting go of some holy cows, be they plastic or styrofoam. And the closer you get to no waste at all, the deeper you wade into territories that are no longer about stuff, but about culture and consciousness and understanding your place in the cycle. So… there comes a point in an ambitious endeavor to eliminate waste at which a majority of things that are recyclable and compostable are being recycled and composted, and yet there are still things in our modern waste stream that just don’t fit the bill. And who better than the artists of the world to not only come up with imaginative ways to re-purpose these discarded items but to show us the absurdity of making many of them in the first place? 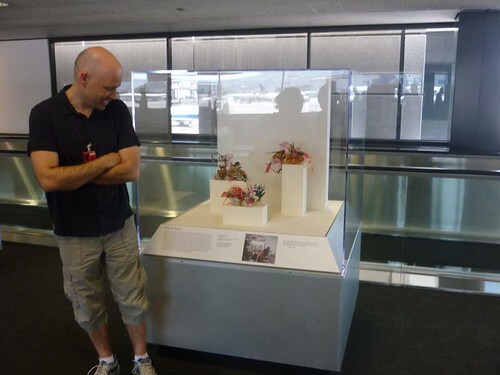 Artist David Hevel looking at his creatures of consumptive bliss made from accumulated masses of trendy trinkets and throwaway tchotchkes from the dump pile. Juxtaposing mid-American aesthetics of taxidermy and floral arrangement with the gossip, glamour, and glitz of Hollywood royalty, Hevel’s surreal garden reveals the absurdity of American consumerism, global economy and the chaos of mass media. 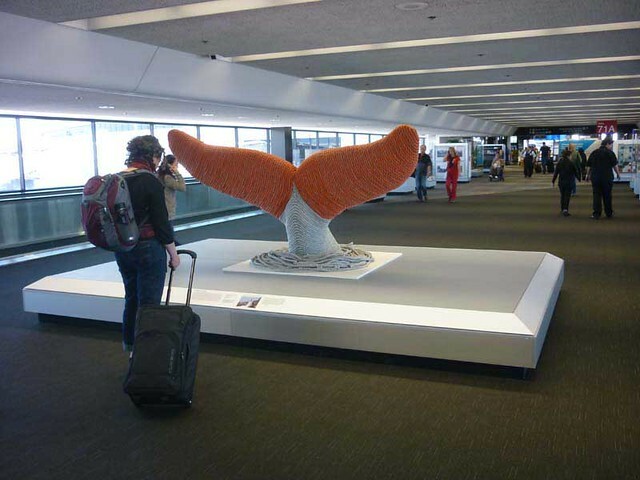 Having been to the Transfer Station and seen some of the trash art right at their source I was excited to see these creations in a totally unexpected environment — the airport. 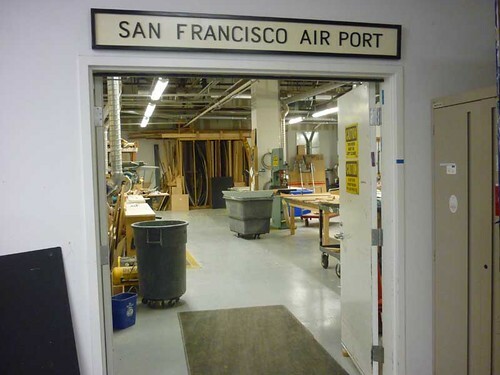 I knew that SFO always has really cool exhibits, but it wasn’t until Tim O’Brien met our group at the former food processing plant turned museum shop at West Field Road that it became clear just how big of an operation SFO Museum (SFOM) is. 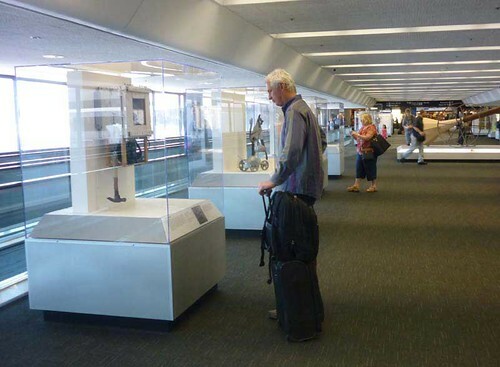 In 1980 SFOM became the first cultural institution of its kind located in an international airport, and in 1999 the first museum in an airport to receive accreditation from the American Alliance of Museums. 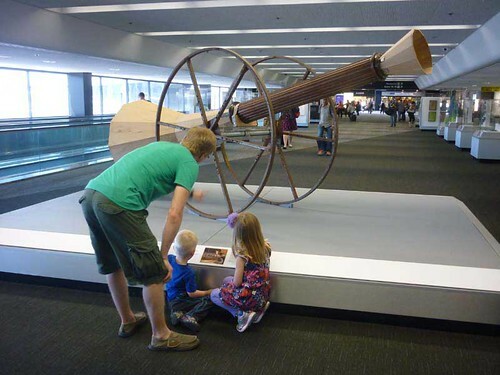 SFOM features more than twenty galleries throughout the Airport terminals, displaying a rotating schedule of art, history, science, and cultural exhibitions. 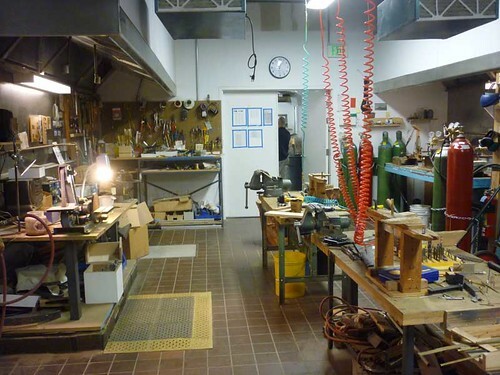 All the prep work — the display cases, mountings, welding and painting — is custom-done right here. 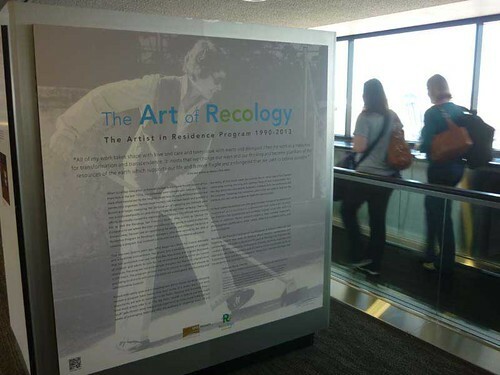 No wonder everyone is really psyched about having the Art of Recology here. For the artist-in-residence program this is the biggest exposure in its history, but the folks at SFOM were equally excited about putting together such a unique show. And it has really turned out to be a show stopper: I’ve never seen so many people of all ages just stopped in their tracks at the airport for anything other than food or waiting at the gate. Once people realize what they’re walking by, they can’t help but take a second and third look. 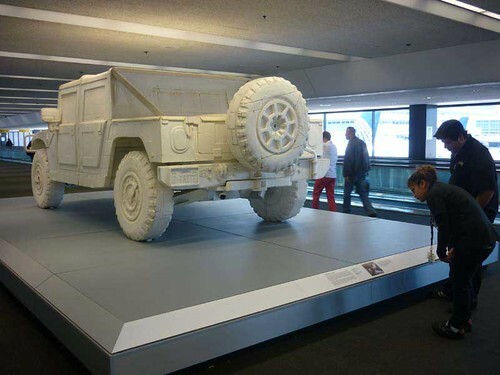 The depth and breadth of the work, made completely from recycled or reused materials, is really stunning. 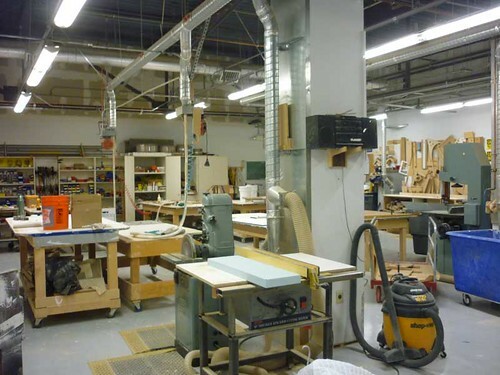 You can tell that the artists, who have 24-hour access to a studio space and can scavenge to their hearts’ delight in Recology’s public disposal and recycling areas during their residencies, are stretching people’s relationship with the material world as well as their own. Remi Rubel first started working with bottle caps while she was an artist-in-residence at Recology San Francisco, making a series of collaborative bottle cap quilts with forty-five Youth In Action Corps members to expose these inner city youth to the concept of recycling as an art form. 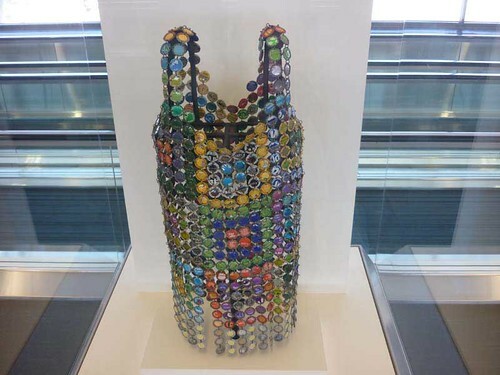 Her artistic creations — include sculpture, clocks, frames, furniture and even clothing — are made with recycled street and junkyard treasures; but the bottle cap remains her most favored material. Michael Kerbow chose the word “Transmogrifications” — meaning changes in appearance or form, especially those strange and grotesque — as the title for his residency exhibition. 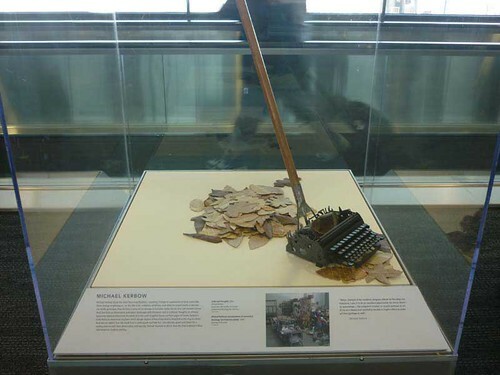 In Collected Thoughts, an antique typewriter keyboard becomes the teeth of a rake used to gather leaves cut from pages of books. 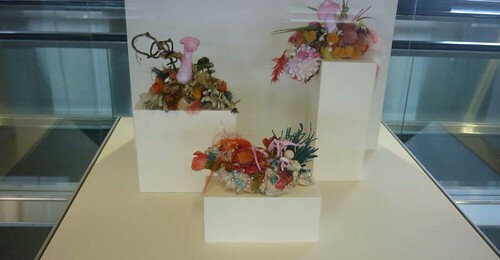 Linda Raynsford‘s metal and mixed media work explores cultural stereotypes and social mores and reflect her emotional angst regarding social and cultural pressure. 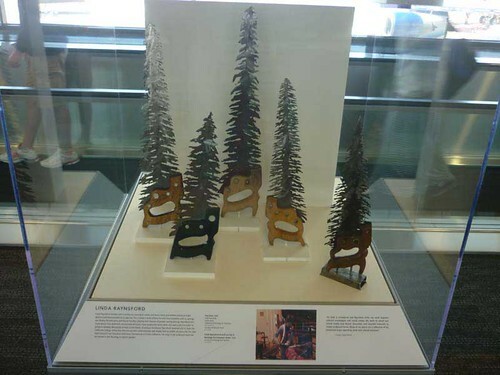 Tree Saws delves more deeply into environmental issues, using a plasma cutter to produce detailed silhouettes of trees in the blades of antique handsaws. 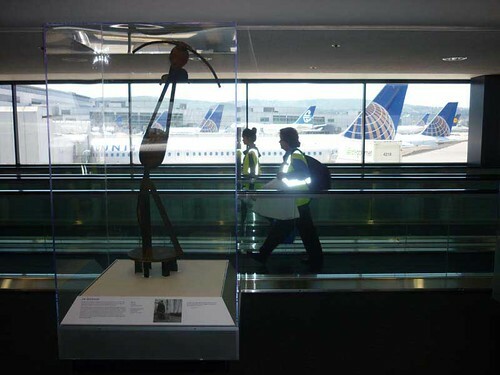 Passengers sauntering by Jim Growden‘s wood and metal Nemo on airport escalators. 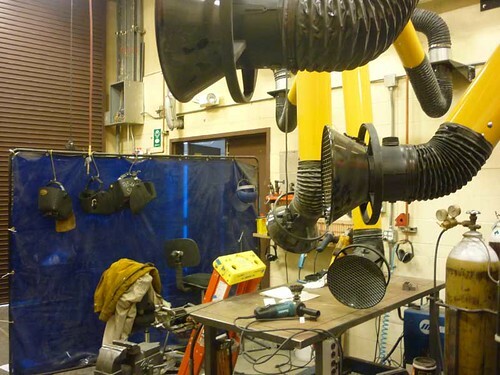 Doing welding and woodworking with found and discarded objects, Growden likes to transform materials into entirely new things, looking as if they might have been something useful in the past. I think it’s exactly this subtle kind of persuasion through direct exposure that I like about this exhibition, and in fact, the entire program. 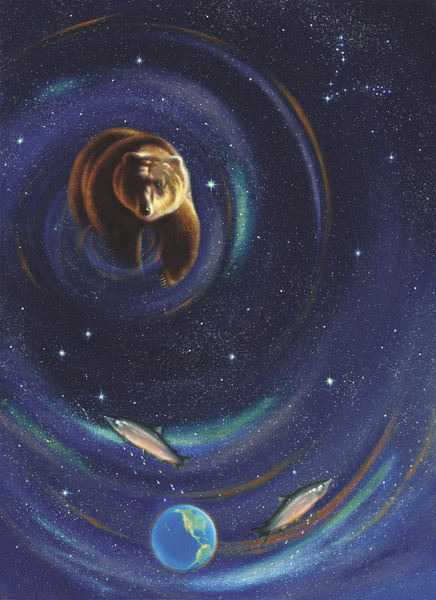 Sharon Spain, coordinator/curator for the program, says that while many artists come to their residency with a practice of environmental or political engagement, they all depart with a better understanding of the perilous state of our environment. “Though not everyone might self-define as an activist, all have been activated on one level or another by their residency experience,” Spain says. Karrie Hovey came into her residency intrigued by the impact of global trade, patterns of consumer culture, and the aftermath of our consumption. 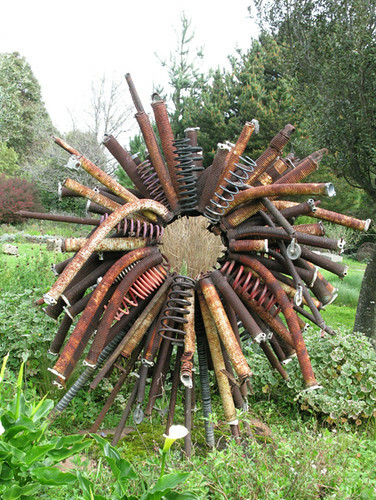 Mum-Fall Harvest is made from discarded books she constructed into a field of repeating chrisanthemum forms. 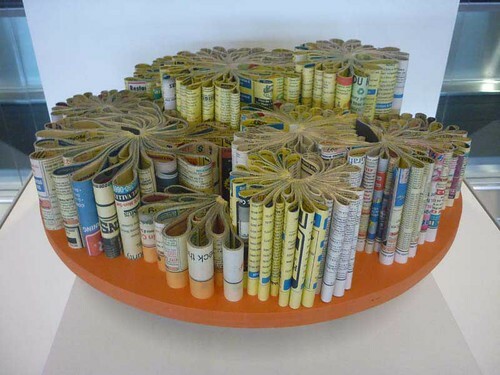 Like these flowers that are sometimes associated with grief, this work can be seen as mourning the loss of physical books while also referencing the trees used in their creation. 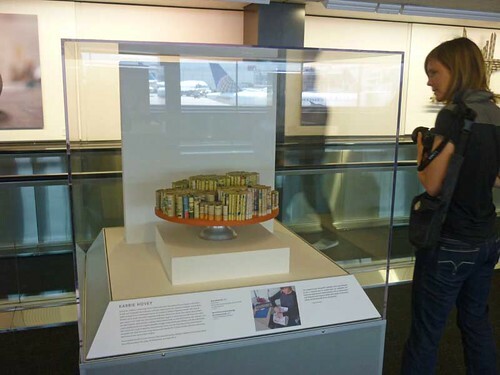 So just as the artists themselves are deeply affected and changed by their time at the dump — becoming more vigilant recyclers or anti-plastic converts, or simply making more conscious choices in the materials they use for their own work — their “Art from the Dump” gives thousands of adults and children each year who attend tours, come to AIR shows, or see exhibitions like the one at SFOM a chance to gain a deeper understanding of our consumer culture without being preached to. 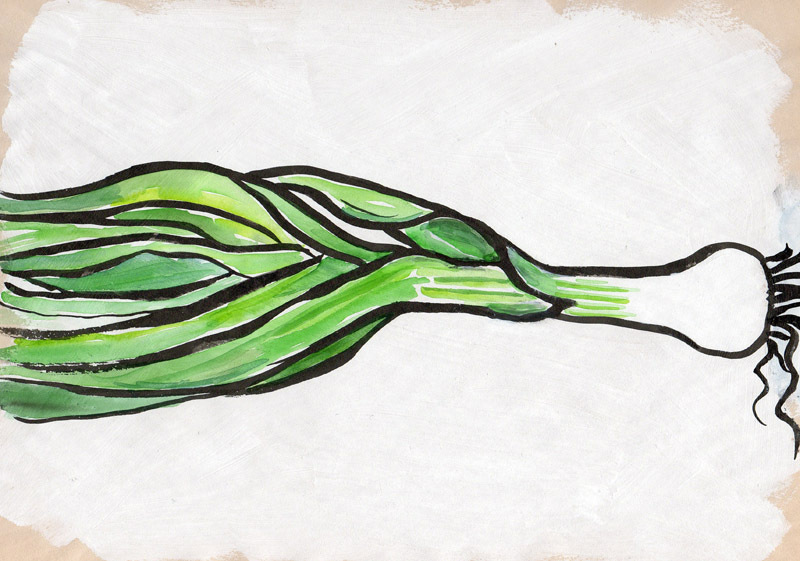 Lauren DiCioccio makes meticulously crafted artworks that replicate everyday objects. She describes her subject matter as things that are “obsolescing,” such as newspapers or handwritten letters—forms increasingly abandoned in favor of more expedient and impersonal technological options. 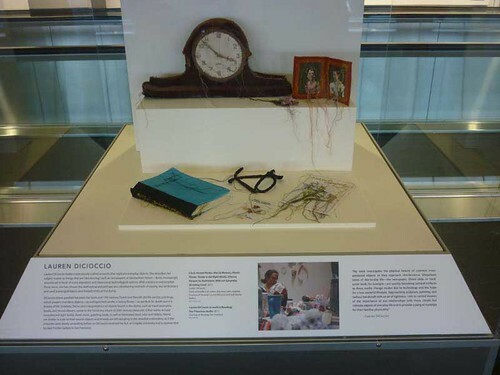 With a desire to memorialize these items, she has chosen the methodical and perhaps also obsolescing methods of sewing and embroidery and used scavenged fabrics and threads while at the dump.